In the past we had a series called “Access foibles” which featured one image, with an explanation or tip of what was in or out of compliance. These images did not prove very useful for our readership because you all had to look at each one to find a discussion of what you found relevant. So I am going to try posting an extended explanation, to make things easier for you. This article is about ADA compliant parking and the path of travel requirements. This discussion is NOT meant to be exhaustive. If it was, I would probably need to write a small novel. I am going to cover 3 images. For the record, none of these images here resulted directly from any ADA compliance study. These images were photographed by me, on my cell phone in my journeys across Southern California. The properties depicted do not belong to anyone I know, and are only discussed on here for educational reference as to their ADA compliance. I am not going to do anything else with these images, nor do I keep track of where each image originates. If anything, the glaring ADA violations discussed in this image should impress upon you all how ubiquitous ADA violations are, and how easy it is to find a place that isn’t in compliance. The first item is particularly difficult to surmise because it’s dependent on what the different studies and committees have decided is both achievable for businesses and most helpful for those who need those dimensions. The first item is also the easiest to look up because it’s specifically dimensioned. The second item is a little harder to do because it’s according to certain principles, such as the pedestrian envelope. The pedestrian envelope isn’t a specific construction — it’s an amalgamation of the different needs of pedestrians, be they semi-mobile, on wheels, completely ambulatory, or slightly ambulatory. Much like egress and ingress (that the Fire Marshal would use to determine the requirements for exit and entrances, as well as the number of those portals), the pedestrian envelope must always have a certain number of requirements. What this article is about is how the pedestrian envelope affects actual parking spaces. Even, if you have not read ADA Requirements above, you should understand why this image is here. From every disabled parking space there should be an access aisle. This access aisle must connect to the accessible path of travel. Failure to do so results in what is known as an inaccessible parking space. How must this parking space connect? Firstly, individuals with disabilities tend to travel slower than individuals who do not have disabilities. One could be in a wheelchair, or they could use a walker, or cane, or be legally blind. Preferably, paths of travel should not cross vehicular traffic. But when they inevitably do, areas that are shared by driver and pedestrian must be blue striped and hatched like in the photo. These areas are known as crosswalks. Crosswalks are an integral part of the accessible path of travel.For this purpose, the blue striping helps alert both drivers and pedestrians that this is an area reserved for those who walk. Individuals who are legally blind may not be able to see very well. They may be able to see the blue striping if it contrasts with the pavement but they definitely cannot see other drivers’ faces. This means that they cannot tell if a driver sees them or not. Legally blind individuals look like everyone else. Drivers may assume that such a person sees them and will stop walking. There is however, a second problem with this photo. If you look at the bottom of the fence, there is a guide rail for the wheel. This guide rail is larger than 1/2 inches and presents a barrier for individuals who shuffle their feet (or their walker) or individuals in a manual wheelchair. Many of us who are also not disabled have tripped on such barriers. The second image presents more parking and path of travel issues. This picture should be pretty self explanatory. Here we have an access aisle that is supposed to use the break in the fence as a way of transition onto the general pedestrian path. But there’s a trash can in the way. The trash can is not mounted, but it is made of concrete so as to be heavy (so it won’t get stolen). This means it cannot be moved easily. Nonetheless, the parking site is small, and this franchisee decided to put the trash can here for the convenience of their patrons. Whoever decided to put the trash can there doesn’t understand that this presents three problems. The first issue stems from a reduction in the path of travel. There isn’t enough space now for the pedestrian to maneuver with their mobility devices around the trash can. (The access aisle is also rather narrow, being in-compliant, but that’s not easily visible in the photo unless you have experience measuring such a space). The presence of this barrier prompts the franchisee patron to travel around the back of their vehicle into the drive-thru, presenting a possible opportunity for an accident. You can imagine the lawsuit which would ensue if that happened! The second issue stems from a barrier in the access aisle for the van chair lift. A van chair lift won’t deploy if there’s an object in the way. Again, the disabled individual is trapped and needs to move their vehicle or park somewhere else. The third issue is simply that such a trash can would block the passenger side door of anyone trying to exit the vehicle. Disabled individuals can drive, but sometimes they do not. Someone who is mobility impaired has enough problems getting in and out of their vehicle. To ask them to squeeze out of their space presents an added barrier which may be insurmountable. If such a patron tried to squeeze out of their vehicle, they might fall and hurt themself. You can imagine the problems here that could result from that situation. You can bet that this franchisee will probably say Why do we need to comply? No one who is disabled ever comes in this store! Well, now you know why no one who is disabled goes to their store. Such potential clients probably saw this trash can and decided it wasn’t worth the hassle. And after everything is said and done, why make things harder for your customers to give you money? The first two images dealt with issues that a building inspector may not realize as in both situations, it’s possible the owner decided to place those barriers there, unwittingly violating the ADA. This image is a little different because it requires professional assistance to be implemented. If the pictured construction looks sharp, it’s because this is brand new, as of 2011. For those of you who know the construction and design process, it’s more than likely that this construction had to be given a thumbs up from the plan check counter. Even still, this is a clear case where not only the ADA is violated but also the local building ordinance failed to provide guidance and protection to both future patrons and the building owners. Besides the common sense understand that access aisles should not connect to a curb without a curb ramp, there’s also a requirement that curb ramps need to be present where there are curbs. And curbs there are! Now if this was not enough, there’s also a requirement for the access aisle slope to be less than what a curb ramp needs in order to be functional. The presence of any curb ramp in the access aisle would violate this requirement. For your reference, curb ramps are any sloping surface which transverses a curb. Curb ramps can slope up to a maximum of 8.33%. 8.33% is 1:12 meaning that for each vertical inch, a curb needs to have a horizontal length of one foot. In California, curbs are steeper than in most other states. Usually curbs are six inches (or more) high. I didn’t measure these curbs but obviously, 2% < 8.33%. Now understand that these three violations are just the California Building Code! The ADA has matching Accessibility Guidelines also similarly violated. If anything, in order to be compliant, instead of built-up curb ramps that project into the access aisle there should have been curb cuts installed. A curb cut would have also used less concrete as the head walk could have been lowered to street level. Insofar as how this affects people with disabilities, a curb ramp in the access aisle presents an uneven surface such that a van chair lift will not deploy. 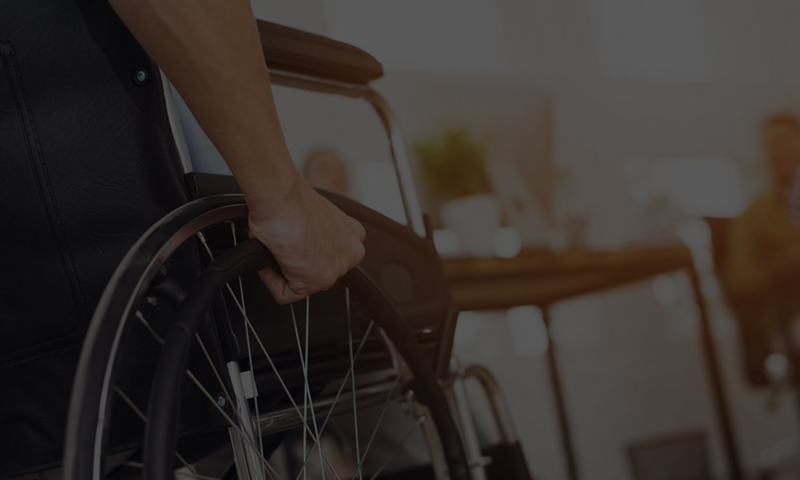 Wheelchairs that have to be placed on an uneven surface also have a tendency to roll. Grandma has enough problems walking for short distances, for her to have to deploy the chair and sit on it is hard enough without also having to chase after the chair. The access aisle closest to the camera may be wide enough for wheelchair deployment. But to place a curb ramp alongside it in this manner creates a side flare which becomes a potentially insurmountable barrier. Transitioning onto steep surfaces tips wheelchairs, making it unsafe. For someone in a wheelchair to use this ramp, they would have to go into the vehicular right of way to enter it. The large curb ramp also invites delivery trucks to park in front, blocking the disabled spaces. The ADA also requires that pedestrian curb ramps not be used as loading ramps. What’s the solution if you are this building owner? Well, relocating the access parking might be an option, or extending the cross walk so the curb ramp could be utilized. This really depends on the rest of the site configuration, however.